What’s going down in Columbia, MD? Only a bit of fine eating and drinking, that’s what! I’ve always had a think about all these ‘ruddy chain restaurants’ (don’t forget, I’m British!) in Columbia and when a place pops up that is different, unique and offers me something off the beaten track, I’m so there. Gadsby’s American Bar is located off the 100 in Columbia, and whilst I totally don’t get the location (a business park), what’s inside rocks. Gadsby’s describes itself thus: ‘Gadsby’s Bar American is a unique restaurant offering progressive American cuisine from Chef Robert Gadsby. What is American cuisine, exactly? American cuisine is the culmination of regional influences on America over the last several hundred years. The best American cuisine is a combination of American ingenuity, with a French taste for sophistication, Italian outlook on sourcing the freshest local & sustainable ingredients, and Japanese discipline. These theories shape the cuisine at Gadsbys. Gadsby and his culinary team offer an approachable & comfortable menu for both lunch & dinner. Our lunch menu includes classic Regional American comforts and a three course tasting option. For dinner, we offer seasonal beginnings, followed by pasta courses, seafood courses, meat courses, cheeses and desserts. They also offer a selection of 100 percentdomestic wines and craft beers sourced from all over the country. But what makes this place stand out is the cocktail program, which is utterly fresh, fun and unique. Chad reigns over the cocktail bar and can give Tom Cruise a run for his money, that’s for sure! Chad says of his cocktails: ‘Cocktails? Think again! We have carefully recreated some traditional and familiar bar drinks. By keeping the integrity & flavor profiles we have birthed something new, fashionable, and exciting.’ They sure do! Lavender infused drinks with protein stabilizers and cucumber cocktails – I didn’t realize that even alcoholic beverages could be ‘healthy’! 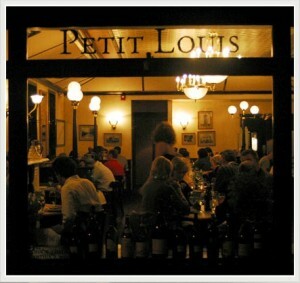 Giving Gadsby’s a run for their money with class and sophistication is Petit Louis, located at the Lakefront in Columbia. Wine tasting is the way to go here – their wines are served well and their food is amazing. I feel like I really am in France when I am this restaurant, which has a sister bar and restaurant in Baltimore. The menu offers a variety of classic French bistro dishes while highlighting the freshest seasonal and regional ingredients. Savor Steak Frites, Confit de Canard, Poulet à L’Estragon, Truite Almondine, Escargot de Bourgogne, Cassoulet, and Boeuf Bourguignon among the selections. That, friends, is proper French food. Delicious! And I have to hand it to the waiting staff, they know how to put on an event and get the customers in. And the location? Well chosen, Cindy Wolf! Nice work, Columbia – I never say no to new and interesting places to eat and drink. Now, where to have my 40th…? !